The Gruvy Awards are chosen by AnalogPlanet's editor, Michael Fremer, and go to products that are found to possess a combination of high build quality, exceptional sonics and in the case of less expensive gear, provide great value for the money. Vinyl records awarded Gruvys are musically and sonically outstanding and also well mastered and pressed. We've sorted them into two categories: New Records, and Reissued Records. When two talented, cussed men such as Harry Nilsson and Randy Newman get together to record an album, you can be sure of an exceptional record filled with great vocals and poetry. Nilsson, who is described as a man who performs his songs with one cynical, laughing eye and one nostalgic, tearful eye in Rowohlt’s Rock-Lexikon, finds inspiration in the then relatively unknown Newman, a docile but caustic social critic who often attacked American society in his songs. 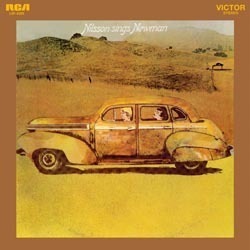 In the layers and harmonies achieved partly by overdubbing, and which alternate between cowshed, barbershop and the Beatles, Nilsson manages to make his bitter words somewhat easier to digest. He relates the bizarre chronicle of a couple who have a dull relationship and who morbidly look forward to passing away in an old people’s home ("Love Story"), or he swears his undying love to a certain Caroline in springtime, or he is transported back in time in his mind’s eye to an idyllic little town in the countryside ("Dayton, Ohio 1903"). A weighty musical background would lend nothing to these highly sophisticated songs. Piano chords, a little bit of electric harpsichord, and a tinkle on the organ keys here and there suffice to dally in an old-fashioned manner – with a sarcastic smile or even a nasty grin – in the desolation of reality, without getting the blues. Best of all, here is the beauty of Nilsson's voice, recorded closely miked and sans effects or reverb. He's right on the mic and right in your room for most of it. His performances are astonishingly complex and ever-changing. The more often you listen the more that's revealed and the more you will appreciate. Doing so is made easy by a superb set of basic piano and vocal tracks, deft splicing and of course the overdubbed Nilsson chorale background singers.